26054 NETSP1942.jpg 500X638\NETSP1942.jpg Send A Hint! 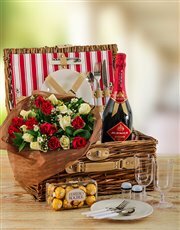 Spoil your loved one and take them on a romantic date under the stars with this picnic basket filled with delicious Ferrero Rocher chocolates, J.C. Le Roux Sparkling Wine, perfect picnic cutlery for 2, a bottle opener, salt and pepper pots and a beautiful bouquet of mixed red and white roses. Get this Romantic Roses And Picnic Basket For Two delivered with NetFlorist. Get this Romantic Roses And Picnic Basket For Two delivered with NetFlorist.